We'll make the Keynotes available here as soon as possible after they happen. Video of the sessions and tutorials will be available a few weeks after the end of the conference. 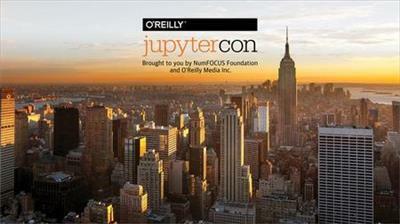 JupyterCon New York 2018 gathered thousands of data scientists, business analysts, educators, and developers from around the globe to learn about recent developments in the Project Jupyter ecosystem. 100+ Jupyter experts spoke at the conference, providing guidance on how to use Jupyter Notebooks, JupyterLab, JupyterHub, and other Jupyter toolsets. This video compilation is a complete recording of each of the 14 keynote speeches, eight tutorials, and 64 technical sessions delivered at the conference. If you're a business leader who wants to transform your data into a competitive advantage, an educator looking for a better way to teach, or a researcher who needs powerful tools for sharing and communicating data analysis, the JupyterCon NY 2018 video compilation is a great place to get started. Keynote speeches by Luciano Resende (IBM Watson) on how IBM leverages the Jupyter stack to offer business critical services; Will Farr (Stony Brook University) on the benefits of using Jupyter for large, global scientific collaborations; and Mark Hansen (Columbia Journalism School) on why today's new generation of journalists must understand and use the newest tools in data analysis. Tutorials by Rachael Tatman (Kaggle) on how to teach a class more effectively using live coding in Jupyter notebooks; Jason Grout (Bloomberg) and Matthias Bussonnier (UC Berkeley BIDS) on how to transition from classic Jupyter Notebooks to the JupyterLab; and Carol Willing (Cal Poly San Luis Obispo) on how to deploy cloud-based JupyterHubs. Total access to the JupyterCon Strata Business Summit-these sessions featured concise, high-level executive briefings on the most important Jupyter developments in business from Jupyter leaders at Capital One, IBM, Oracle, Teradata, PayPal, Two Sigma, Capsule8, GE, and more. Multiple Jupyter usage sessions, including Dave Stuart (Department of Defense) on a "citizen data scientist" program at DoD; and Yuvi Panda (UC Berkeley) on how UCB's MYBinder team develops JupyterHub infrastructure code in a collaborative manner. 15+ reproducible research and open science sessions, including Viral Shah (Julia Computing) on Julia's path toward becoming the default language for all forms of data science; and Adam Thornton (LSST) on combining JupyterLab, JupyterHub, and Kubernetes to enable the analysis of very large datasets. Education and training sessions, including Laura Noren's (Obsidian Security) comparison of data science research infrastructure in Canada versus the US. Jupyter extensions sessions, including Stephanie Stattel (Bloomberg LP) and Paul Ivanov (Bloomberg LP) on how to design and combine extensions to build custom JupyterLab solutions. Data visualization sessions, including Lindsay Richman's (McKinsey & Co.) on using JupyterLab, Descriptionly, and a Python-based Dash framework to create dynamic charts and interactive reports. Enterprise and organizational adoption sessions, including Diogo Castro (CERN) on SWAN-CERN's Jupyter-based interactive data analysis service. Dozens of other sessions relating to topics such as Jupyter communities, kernels, and JupyterHub deployments. More than 70 hours of video to view at your own pace and schedule. free download JupyterCon New York 2018.JupyterCon New York 2018 full from nitroflare rapidgator uploaded turbobit extabit ryushare openload littlebyte zippyshare.